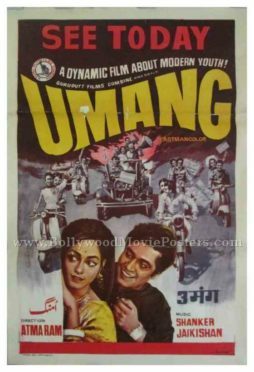 Old Bollywood poster for sale of the Hindi film Umang (1970). Featured here for sale is an old Bollywood poster of the 1970 Hindi film produced by Guru Dutt films starring Subhash Ghai. Printed and circulated a few years after the first release of the film (1970s), this old Indian poster was originally designed for publicity of the film but never ended up being used.